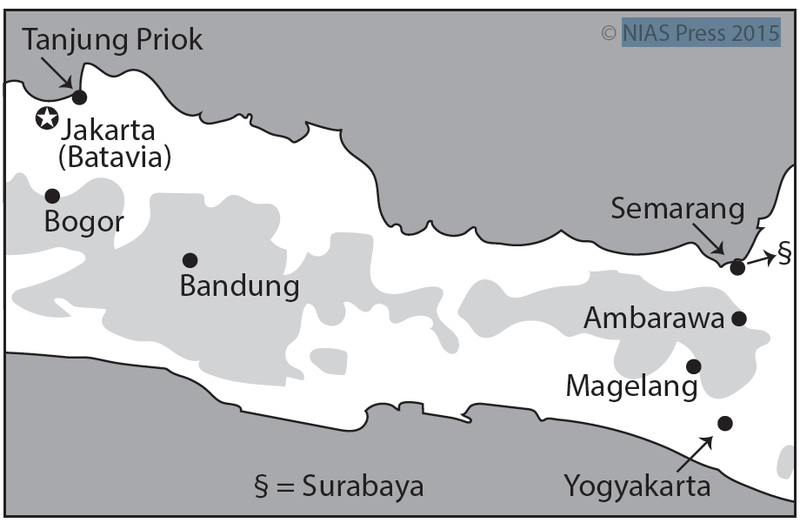 Early Saturday night, 18 August, people had just finished their evening prayers and broken the day’s fast when news of the declaration of Indonesian independence aired over the kampung loudspeakers of Japan Occupation Radio. The Radio’s young Indonesian office workers had taken a first step towards revolution by disobeying their Japanese overseer and broadcasting the news. For the city’s kampung residents, the end had come to forty months of Japanese rule, felt most acutely along the street and in the alleyways through the face-slaps and threats of its military police, the Kempeitai. By Sunday, the end to this punitive justice seemed in sight as the red and white flag replaced the rising sun atop the five-story building of the municipal police building at the junction of Cohen and Darmo Boulevards. On Monday, the Indonesian police on duty in the building took custody of the approximately fifty firearms stored in the armoury at the back. On Tuesday, their Indonesian head, Muhammad Yasin, followed the lead set the day before by Resident Sudirman by formally declaring his support for Independence. The flag above police headquarters flew proud, greeting Peta soldiers entering Surabaya from their barracks to the south of the city after their Japanese commander followed Allied orders and disarmed and disbanded them by Wednesday. These soldiers entered a city after three years of wartime blackout and curfew had come to an end, where street lights shone, markets buzzed with people, and red and white flags adorned pedicabs and street-stalls and the carefully-chalked word, merdeka, stretched across walls in defiance of the Kempeitai. These symbols of national sovereignty echoed the transfer of power underway by Tuesday and Wednesday, when Japanese managers surrendered the electricity station, a hospital, the housing authority and factories over to their Indonesian workers, and as educated Indonesian administrators formed the foundations of government by establishing the Surabaya branch of the KNI (Komite Nasional Indonesia, or Indonesian National Committee), and former Peta soldiers and other auxiliary forces formed the foundations of an army by establishing the BKR (People’s Security Organization). To support the KNI and the BKR, Surabaya’s educated young middle class men formed the PRI, mustering the support of the city’s half a million kampung residents. 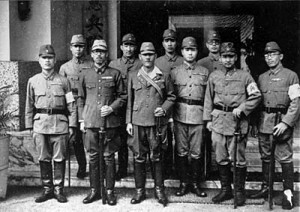 In less than a week, power had changed from Japanese to Indonesian hands in almost all areas except along the street, where Kempeitai guards remained at their posts in accordance with Allied instructions that they maintain order until the pending arrival of a peacekeeping force of British-Indian soldiers. The despised Kempeitai now wore white bands on their right upper sleeves that read ‘Allied Forces Police’, reinforcing the suspicion that they were protecting Dutch interests in the city. These suspicions were further reinforced by 6 September as the first of several thousand Dutch and Eurasians began settling in the city after their release from internment camps elsewhere in Java. The Kempeitai stood guard as former internees reoccupied the European garden suburbs, pulled down independence posters, flew the Dutch flag and fought Indonesians who stood in their way. 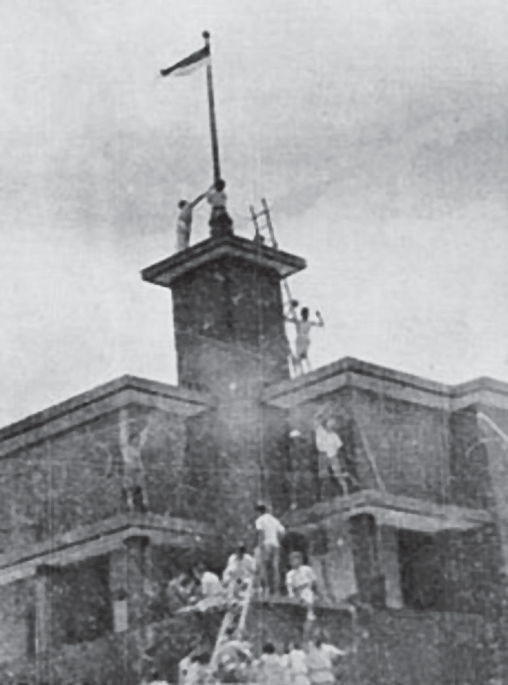 These tensions culminated in the famous ‘flag incident’ of September 19, when a group of Dutch and Eurasian young men entered the Orange Hotel – where British and Dutch RAPWI (Recovery of Allied Prisoner of War and Internees) officers and Japanese guards were stationed – and raised the Dutch flag on the rooftop flagpole. An angry crowd rushed to the scene, burst inside and attacked the Dutch and Eurasian protagonists, while others climbed the flagpole and tore off the flag’s blue strip, leaving the republican red and white. 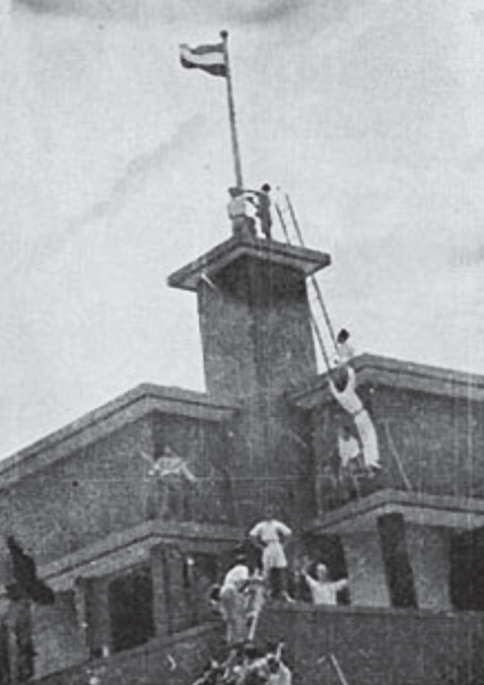 Indonesian nationalists clamber up the walls of the Hotel Oranje, toward the Dutch tricolor, as the 'flag incident' began. Within minutes, the tricolor had been transformed into the red and white Republican flag.